When I heard that Dark Shadows was available on Amazon Prime, I was intrigued. I hardly need a new show to watch, but I've always been slightly curious about Dark Shadows... it's said to have paranormal elements (well, duh) and even time travel. So I looked, thinking I'd start from the very beginning. Unfortunately, I looked for "Dark Shadows" and the very beginning is called "Dark Shadows: The Beginning" and didn't show up on my search for some reason (Amazon.com has some weird search quirks). 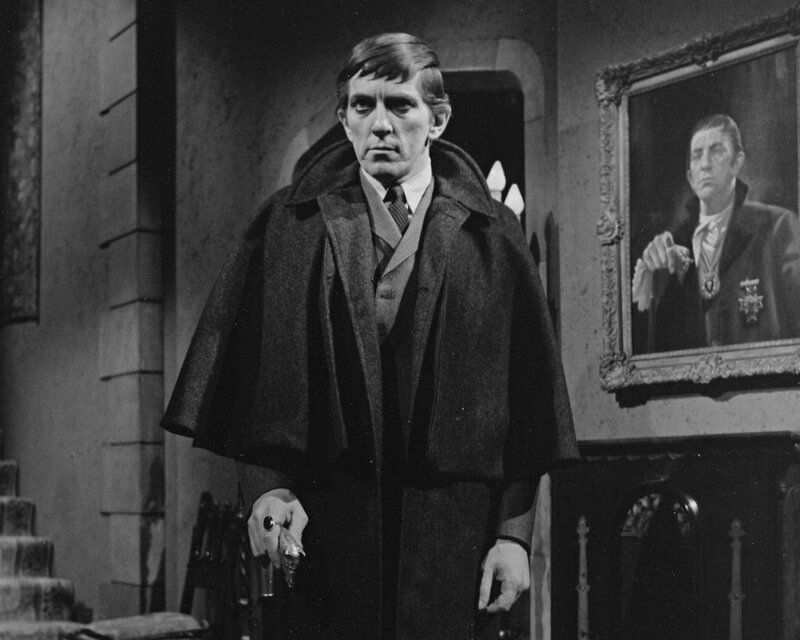 The result is that I actually started watching the series with episode 210, the first appearance (however brief) of Barnabas Collins, aired on the 17th of April, 1967. I'm now on episode 296, having just seen the first color episode (#295) and gone through some significant plotlines of the series. I didn't think I would be all that interested. I mean, I've never really enjoyed vampire stories OR soap operas, so I figured I would be indifferent to this one. It's a daily show, each episode about 20 minutes long. And it's got all the silly drama of bitter romance and family disfunction. But it's also really quirky, with the matron of the house having a terrible secret, the nature of which I didn't learn until well into the show. The daughter is a typical blonde with an attitude. The uncle is an upper-class twit. The governess is normal, only she's apparently got a mystery, too AND she introduces the episodes in prose so purple it's royal. The conniving conmen preying on the family get their come-uppance, and new characters are introduced as needed. Best of all, this is practically live television from the 1960s, so you can get a definite sense of the conditions the cast were shooting in. Lines are constantly being flubbed as if it were live, and everyone carries on. The sets wobble more than the worst of Doctor Who. Doors stick, characters trip, boom mics make brief appearances and I swear I saw a guy walking across the back of a set once who really ought not to have been there. In one segment, someone was slamming doors in the distance and someone was coughing - but despite it being a secret meeting between two characters, they carried on like there were no background sounds. I've been thoroughly entertained by both the silly plots and the silly production values. I've also done a bit of "spot the actor" with a few characters. The sheriff from these seasons later became MacGyver's boss. Sam Evans, father of a kidnapped girl, is best known for playing John Hancock in 1776. The kidnapped girl herself also appeared in tons of other shows. In short, I'm really enjoying watching it while I do other things online. At 20 minutes a pop, the episodes are like snacks. None of them are so long I get bored. I'm not sure everyone would like this show, but I'm really happy I delved into it. The pre-Barnabas episodes are, from what I know about the show, not supernatural, just gothic noir. I started watching shortly after Barnabas showed up, having read in 16 Magazine about a soap opera with a vampire. It took watching a week or longer for me to see Barnabas, but by then, I was hooked. It wasn't my first soap opera -- that was The Edge of Night, which I watched with my grandmother -- but it remains my favorite. In the late-'80s, I got to meet Mr. Frid when he gave a reading of Shakespeare at the library where I was working. He was very nice. He did library programs for free, using them as rehearsals for his paid readings in small theaters. Well, the characters reference supernatural events: a seance in which Josette talks through Vicki, David says he speaks with ghosts... so I think I'll go back at some point to see. I never saw the pre-Barnabas episodes. I only read about them. 16 Magazine nicely wrote up summaries in every issue. I keep thinking about watching the whole show from the beginning, but never seem to find the time. There's always something new to watch. My favorite thing about the show was finding mistakes. It was filmed live, without editing apparently. There were instances of characters/actors calling other characters by their real names, stagehands being seen in the background, usually while the credits were rolling, that sort of thing. Also, I didn't find Barnabas all that scary. Quentin the ghost, however, I found rather frightening. David Selby played him wonderfully.